SCVHistory.com LW3069 | Romero Canyon | Castaic High School Site: Jackson & Winkler Homesteads, 1922. 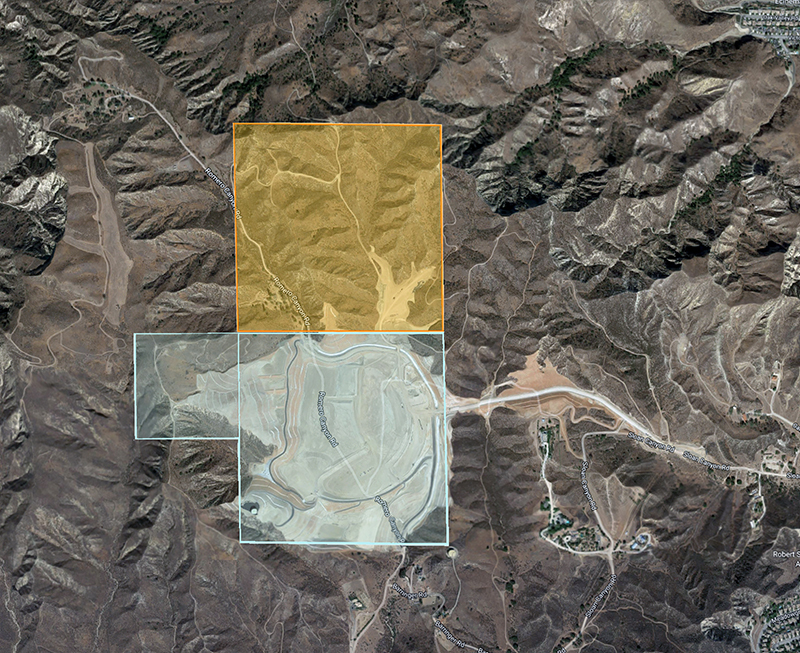 Boundaries of the Francis C. Jackson and Norman C. Winkler homesteads in Romero Canyon, superimposed over a 2017 Google Maps image of the William S. Hart Union High School District's freshly graded Castaic High School site. Francis C. Jackson (light blue on map) was granted two patents to 200 acres of land on April 17, 1922, under the Homestead Act of 1862 as follows: the northwest quarter of Section 27 of Township 5 North, Range 17 West, constituting 160 acres (the bigger square); and the northeast quarter of the northeast quarter of Section 28 of Township 5 North, Range 17 West, constituting 40 acres. (A section is 640 acres.) The federal government retained oil and gas rights. Norman C. Winkler (light orange on map) was granted a patent to 160 acres of land on Dec. 18, 1922, under the Homestead Act of 1862 as follows: the southwest quarter of Section 22 of Township 5 North, Range 17 West. (The government did not retain oil and gas rights.) A chicken rancher, Winkler had filed for a stock-raising patent in 1916 and then filed a homestead entry on Aug. 9, 1920. He built his home(s) on this parcel and patented nine additional parcels farther up Romero Canyon for his livestock operation. See and read more about Winkler here. 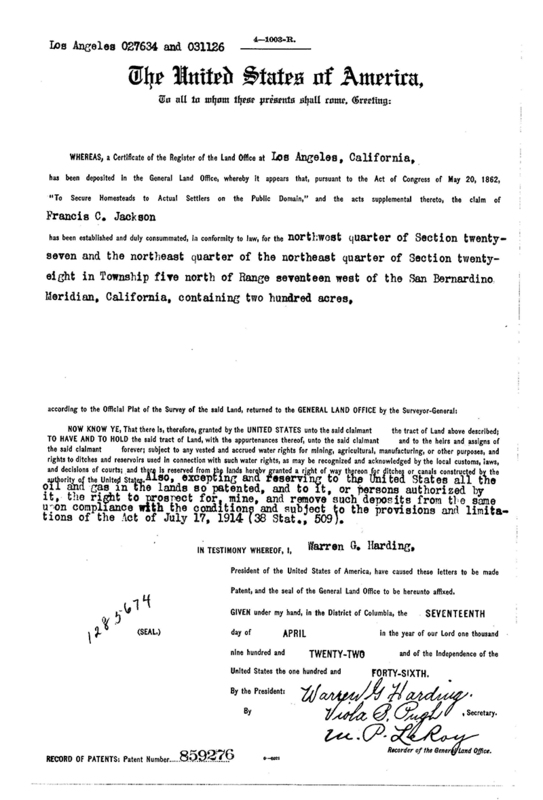 Francis C. Jackson land patent. Click to enlarge. 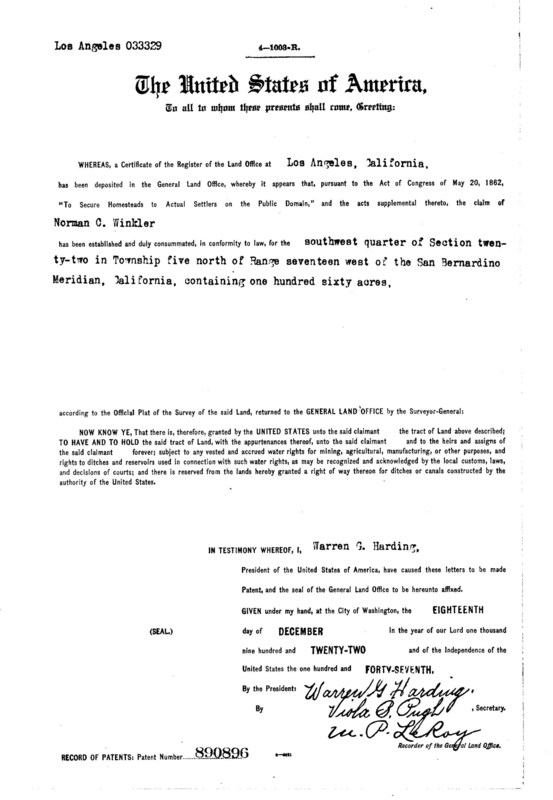 Norman C. Winkler land patent. Click to enlarge. LW3069: 9600 dpi jpeg compiled from Google Maps image and BLM data.